Do you like Heroes of Myths? Share it with your friends. Heroes of Myths is a greatly crafted combat strategy, whose storyline takes place in ancient Greece. 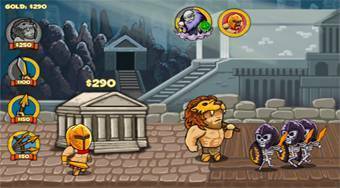 In each round, your task will be to fight Spartan heroes with evil enemies who want to destroy your sacred temple. Shop for heroes, send them to battle and use special attacks of your chosen god. Get new heroes and other useful upgrades for your money.